The Dividist Papers: 2008 Election Prologue - Check your assumptions. 2008 Election Prologue - Check your assumptions. This is not the post I expected to write. I expected the Democrats to take the House, and the Republicans to hold the Senate. That would have given us a divided congress in addition to a divided government, and (presuming that incumbent advantage reasserts itself in '08), a reasonable likelihood that we would continue to have divided government after the '08 election, regardless of which party is seated in the oval office. I half expected to be putting the DWSUWF blog on a two year hiatus - declaring there was no need to advocate for a Divided Government Voting Strategy in '08, since cirumstances dictated we would have a divided government regardless. The blog would not have disappeared of course. We just would have spent the next two years on interesting topics like: The Chicago Bears Sherman-esque march to the Superbowl; innovative abalone recipes; the latest indignity we have suffered at the hands of Microsoft software; techniques for catching big trout in early season Wisconsin water using a weighted variation of the Marabou Leech fly (tied with legs); and whether any residual influence of the autonomous Chinese Kazakh culture imposed during the 10th century Kingdom of Khazaria can still be found in a lineage traced back to the Khotin region of the Ukraine. But all that will have to wait. We are back to politics through 2008. 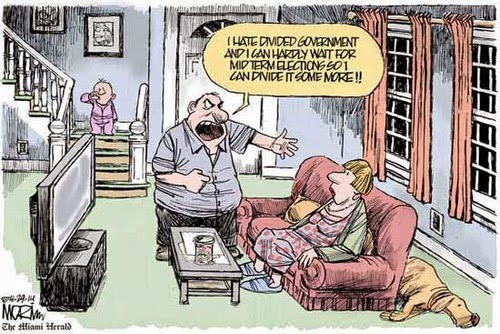 We will have divided government for the next two years. Minimally, we expect to see restraint in the growth of spending and some evidence for more fiscal discipline on the part of the federal government. 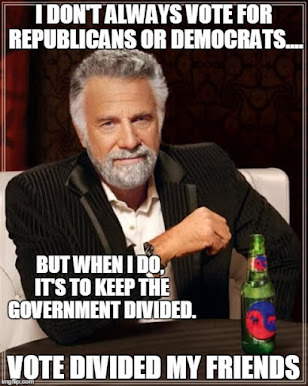 If that does not happen, the foundation for advocating divided government will collapse, and we will refocus on abalone diving on the Mendocino coast. Assumption 2) Democrats will retain their majority in the House of Representatives in 2008. The margin may or may not shrink, but from here it looks like the Democrats will have the edge going into 2008. Incumbents have a significant advantage, and the Democrats have a sizeable majority. The Democrats would have to screw-up on a scale of how the Republicans screwed up in 2006. They would have to pile up a record of corruption in two years comparable to what the Republicans did in six. I would not put either past them, but it does seem unlikely. Also, the Democrats made significant gains in state legislatures and governorships across the country, so they will be in a postion to redistrict to increase their incumbent advantage in 08. We have to assume they will keep the majority in the house. Assumption 3) Democrats have an advantage retaining a majority in the Senate. The Democratic majority in the Senate cannot get any thinner. There is certainly an opportunity and a possibility for the Republicans to retake the Senate in '08, but structural factors argue against the Republicans. 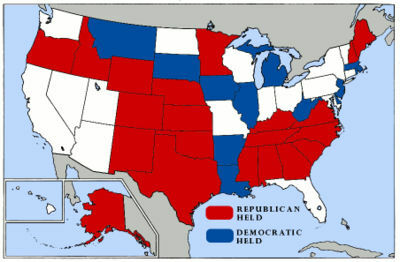 There are 33 Senate seats contested in 2008. Of these, 21 are held by Republicans and 12 by Democrats. Simple numbers - the Republicans have a lot more at risk, and will be playing defense. The Democrats have many more opportunities to take seats than Republicans. Advantage Democrats. This leads to an obvious conclusion. The only way to ensure divided government beyond 2008, is to elect a Republican President in 2008. We have made a few changes to the list. John Kerry and Newt Gingrich dropped off the list. Gingrich, because we found his bellicose World War III ( IV?... V? I lose count) fear mongering to be excessive, bordering on insane. Kerry, because he is a hopeless candidate as evidence by his handling of the infamous botched joke one week before the midterm. Hunter and Obama take their place. I also dropped McCain a few notches, after he disingenuously slammed his fellow Vietnam Veteran to strike a purely political posture before the election. Still, though the bloom is off the rose, a McCain presidency would be fine by me. We will need a Republican President in 2008 to maintain a divided government state. Fortunately we have some great Republican candidates. Hagel, Giuliani, and McCain would all make great presidents, and all are a significant improvement from what we have today. With Fiengold's decision not to run there remain 26 potential 2008 presidential candidates. First, I need to point out the DWSUWF list is not a "prediction" but a preference. These are the candidates we would like to see as President, stack ranked in order of preference. Imposed on this list are two artificial constraints: alternating political party affiliation, and a Divided Government outcome in 2008. With those additional constraints, DWSUWF will be supporting the top Republican candidates in this list, for the reasons outlined in the post. That said, Ripper makes a good point about Al Gore. I considered putting him on the list in the place of either Clarke or Obama. He is a good man, intelligent, articulate, and would have been a good president. Like Kerry, I just don't think he has much of chance getting through the primary process, as he is not very good as a candidate, and I sense that Democrats want fresh blood. mw said "but all that will have to wait. We are back to politics through 2008!" no! No! NO!! SAY IT ISN'T SO !!!!!!!!!!!!. Ayn Rand NEVER EVER said Check Your Assumptions, because she never advocated assuming anything. What she said, many times, was to Check Your Premises, an entirely different thing. 1. The act of taking to or upon oneself: assumption of an obligation. 2. The act of taking possession or asserting a claim: assumption of command. 3. The act of taking for granted: assumption of a false theory. 4. Something taken for granted or accepted as true without proof; a supposition: a valid assumption. 6. Logic: A minor premise. I am using definition 6. You are likely correct on the exact quote. My use is more accurately a paraphrase, in which I have a lot of company around the web. Please feel free to substitute the words "premise" or "minor premise" for the word "assumption" as you read this post. It does not change my meaning one whit. Sorry for the misquote Ayn. Ayn Rand, never said that. A contradiction cannot exist in reality, not in part nor in whole. If you find yourself considering a contradiction as truth, check your premise’s, one is incorrect. Yes I know. You (anonymous) said the same thing several months ago (see prior comments). Which I acknowledged and responded to already (see comment immediately before your).